As temperatures across the country continue to climb, we are reminded of how important it is to pay attention to your body and its need during the hot summer months. It is common for seniors to have a higher sensitivity to the sun, making it especially important for them to watch their water intake and monitor time spent outside. We should all be striving to drink six to eight glasses of water daily, but this goal is even more important to reach when the weather gets hot. 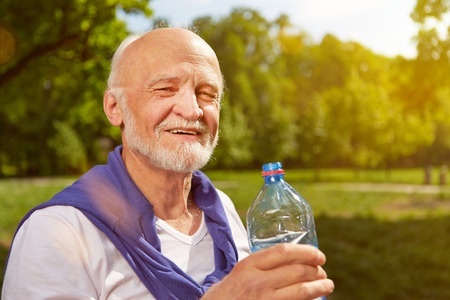 Dehydration is a problem many seniors face in the summer months, so pay attention to how much water you are drinking and be sure to keep a water bottle in hand when you head outdoors. While we all like to spend time outside when the weather is nice, the mid-day heat can be too much for many seniors to handle. Instead of spending entire afternoons outdoors, alternate between time inside and outside, relaxing in the air conditioning to cool off and rejuvenate yourself after time spent in your garden or at the park with your grandchildren. In keeping with limiting your time outdoors, it is also a good idea to move exercises indoor to prevent dehydration and heat stroke. Instead of going for a brisk walk around your neighborhood, spend some time on the treadmill at the gym or do some powerwalking around your local mall. Swimming is another great exercise option during the summer months, as it is easy on the joints and can help to increase flexibility. Take some time to review your prescriptions with your doctor or pharmacist as the summer season begins, as heat can cause different side effects to show themselves. Some medications must be stored between certain temperatures and others can cause your skin to become more sensitive to the sun. To prevent sunburn and the discomfort that comes with it, keep sunscreen on hand during all your summer excursions. Keep a bottle in your purse or vehicle, being sure to put it on when you first go outside, reapplying regularly throughout the day. This summer, pay close attention to the amount of time you are spending in the sun and the amount of water you are drinking for a healthy and enjoyable season. Worried about how your senior loved one will be affected by the heat? In-home care is a way to ensure they have the assistance they need getting things done around the house while still maintaining their independence. For more information about Helping Hearts Foundation and our in-home cares services for individuals in Northern California and Nevada, visit us online or contact us by phone at 916-368-7200 (CA) or 702-755-6548 (NV). This entry was posted in Summer Safety and tagged Helping Hearts Foundation, In-Home Care in Northern California, Nevada In-Home Care, Senior Summer Safety, Seniors Heat Stroke, Summer Safety. Bookmark the permalink.